On the evening of Thursday 8th March 2018 we were delighted to have attended the 23rd Annual Awards event hosted by the High Sheriff of Hertfordshire, Will Hobhouse. The High Sheriff chose Volunteering as his theme for the year and wished to celebrate the many contributions volunteers make across the county by hosting this recognition and awards ceremony. In 2016, 18 applications to participate in the inaugural Building Effectiveness 2017 programme were submitted. The 10 successful participants including Crossroads, were also recognised during this event. 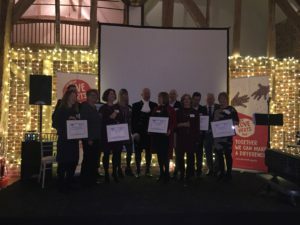 The event was hosted at The Great Barn at Micklefield Hall and was attended by Hertfordshire County Council Hertfordshire Community Foundation, The Lord Lieutenancy and Shrievalty, and previous High Sheriffs among volunteers and nominees. We would like to congratulate all nominees and award winners for their well earned recognition.